12. Belknap Mill, Laconia, New Hampshire, ca. 1825. 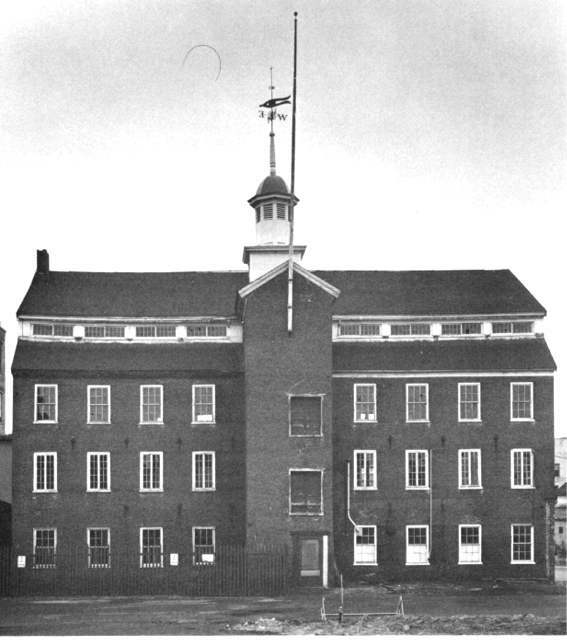 One of the few surviving examples of the early Lowell mill type, with the front stair in a projecting gable-roofed ell on the mill's long side and the small belfry on the ridge. 14. 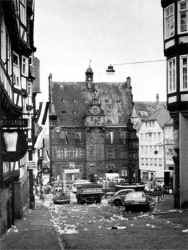 The medieval town hall in Marburg, Germany. This building shows an important similarity with the early Lowell mill type The projecting front ell served the same purpose as it did in Lowell, providing space for the staircase where it would not interfere with the main floor space. 15. Early nineteenth-century warehouse, Copenhagen. A projecting stair was not needed. 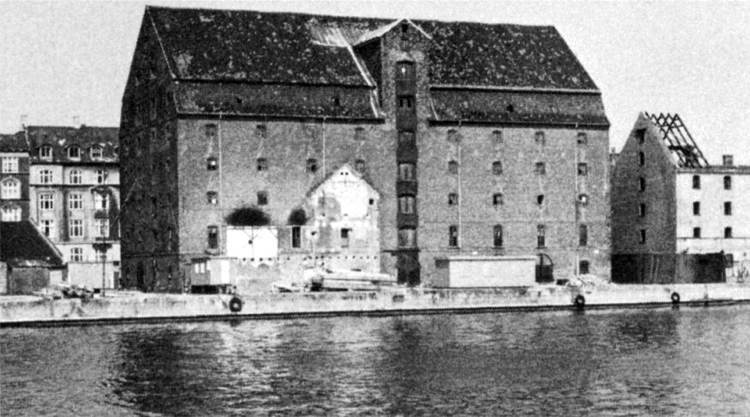 but otherwise the Copenhagen warehouses have a remarkable resemblance to the Lowell mill type. 16. Middle Mill. 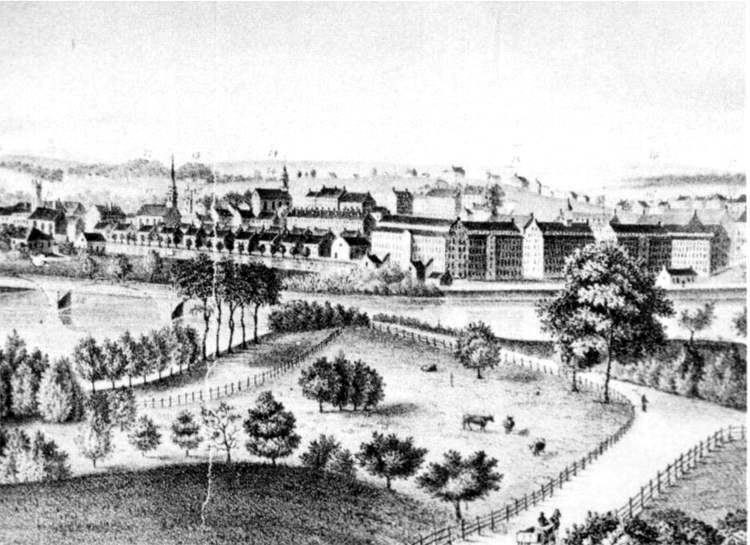 New York Mills, New York, 1824. This is a rare example of an 1820s mill which had unusual architectural pretensions, carrying a full pedimented gable with a Georgian bell tower. 17. 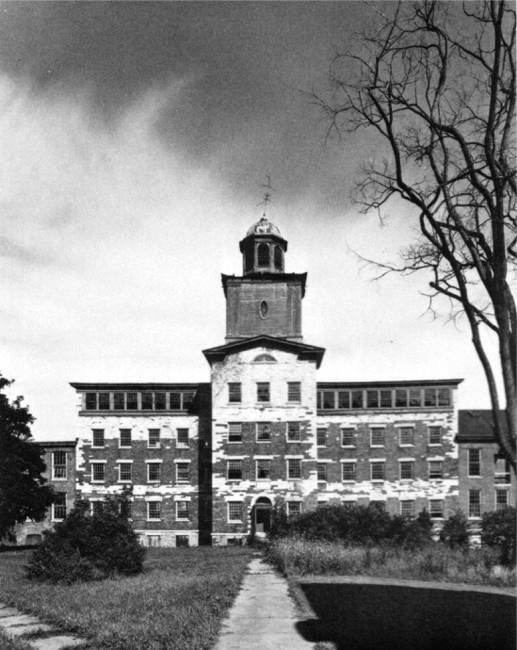 Bay State Mills, Lawrence, constructed in 1845. These mills are the tallest known to have been constructed according to the Lowell plan, and with nine stories, must come close to setting a record for traditional mill construction. Perhaps they exceeded the limits of practicality, because they were demolished and replaced in the 1880s. 21. Lewiston. Maine, ca. 1870. 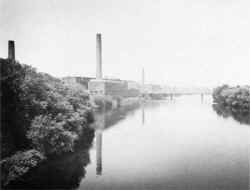 This view of the planned mill town taken at an early stage of Lewiston's growth shows the intentional order of the canal, the mills. and the boardinghouses -all landscaped with elm trees by the developing company. 22. Lewiston. Maine with the elms fully grown, just prior to their demise from the blight. Architecture provides an important reflection of a culture. It is a document of the social as well as artistic attitudes, ambitions, and goals not just of its individual creators, but of society as a whole. City planning provides a similar document on a larger scale, especially if the plan is realized in the third dimension during the same era in which it was laid out. 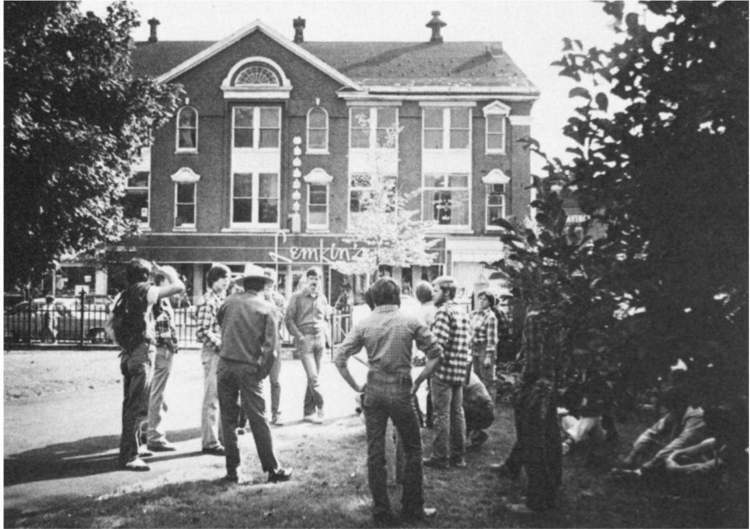 By this token, a "new town" provides an unusual opportunity to examine the impact of the social forces at work on the physical environment of a whole community in a given time, by bringing together the abstract ideals of the founders with the practical realities faced in the field by the community builders of succeeding generations. The planned industrial cities of New England provide rich contexts within which to examine what the built remains of a place can reveal about its social history. Lowell, Massachusetts, the first and most famous of these cities, is particularly notable, for it has long held a special position as a symbol of the rise of industry in the United States, and the social system which supported it in its earliest phase. Now, with the recent founding of the National Park, Lowell has emerged as a new popular historical symbol, gaining a status previously accorded only to the natural wonders of the West and the battle monuments of the Revolution in the East. 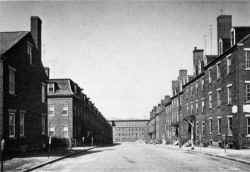 The history of Lowell is commonly divided into two historic periods: the first, a twenty-year period when the city was world famous as an almost utopian, model, industrial community, and the second, when it had declined into an ordinary and drab industrial town. The interest in Lowell as an historical symbol has naturally emphasized the importance of the first period in its history rather than the subsequent years. In fact, the city's resurgence as a National Park came about primarily because the record of its early years made it so famous. Because of this historical emphasis on its early decades, there is a danger of overlooking the valuable lessons that a more comprehensive treatment might reveal. By celebrating the beginning years of Lowell, it is easy to ignore the later evolution of the city as technology advanced, as the community began to mature, and as immigrants began to displace the native workers. Equally significant are the cities which were laid out and established later, according to similar planning principles, namely Nashua, Somersworth, Dover, and Manchester, New Hampshire; Lawrence and Holyoke, Massachusetts; and Biddeford and Lewiston, Maine. A discussion of the architecture related to these later developments in Lowell and its sister cities may add a new dimension not only to our understanding of the growth of industry in the United States, but also to the interpretation of the early history of Lowell, which we are using as a primary example. The stylistic changes which occurred in the designs of the mills of Lowell and related cities between 1840 and the post-Civil War period symbolize the social and economic changes that each city underwent during the same period. These changes in architectural form and style in Lowell, in particular, document the fundamental shift from the relatively comfortable paternalism of that city's early years to the relatively stressful later period. Instead of declining into old age during the second half of the nineteenth century, Lowell was only then beginning to mature as a city. Some of the stresses in its social structures were part of the growing struggle within the local community to break free from the autocratic control of the Boston-based corporate operations. At the same time, the proliferation of machines throughout New England and after-wards, throughout the South, placed Lowell within a competitive framework that was very different from the position it had maintained during the first two decades of its history. This change in Lowell's status can only have been inevitable, but it serves to illustrate the uniquely favorable, but short-lived, economic context in which early Lowell existed. Lowell was largely the outcome of the efforts of Francis Cabot Lowell who, in Waltham in 1813, assembled the first successful, completely mechanized cotton mill in the United States. 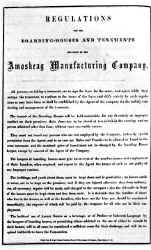 While the importance of Lowell's innovation and the transfer of British technology to America in establishing industrialism should be recognized, the project would surely have failed without the enormous capital resources of a number of Boston entrepreneurs. This Boston money, made in the mercantile trades, was to be used for industrial development when the 1812 war with Britain closed the ports. Lowell was the first major product of the redirection of this investment capital. The city was established in 1822 after F C Lowell's death by a group of his former partners, led by Nathan Appleton and Patrick Tracy Jackson. New England, especially Rhode Island, was already dotted with mill villages, some of which undoubtedly had power looms before the founding of Lowell. Lowell stands out, however, because it was conceived of as an industrial community of unprecedented size even before the first sod was turned for the first mill. 4. 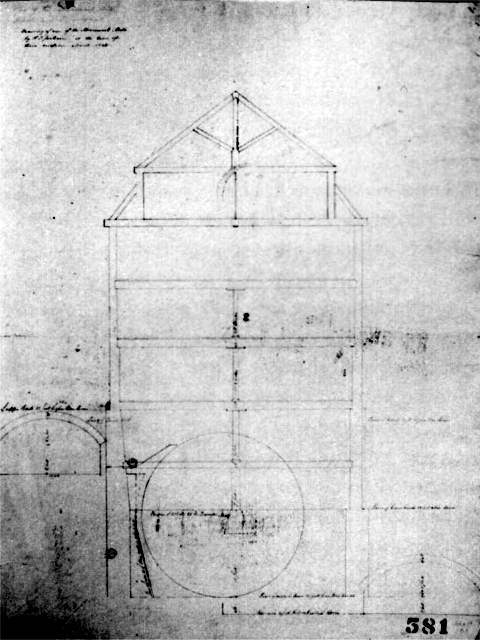 Plan of Lowell showing the Merrimack Mills, 1827. 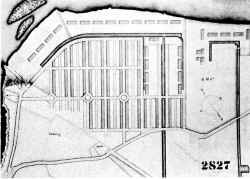 This plan shows the orderly layout of the five original mills and the rows of the first boardinghouses. The plan also shows the original corporation-built church (lower center) and the mansion built for the first and most famous agent, Kirk Boott (right). The layout of the future Boott Mills is barely perceptible adjacent to this mansion. Lowell was in every sense a planned, industrial "new town." For the first time the scale of the factory had expanded beyond the architectural confines of a single building, and the problem of housing the laborers had transcended the simple provision of minimal residential quarters. 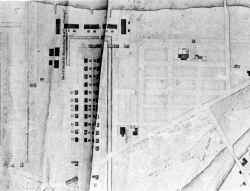 Lowell's original layout was more orderly than most of the earlier, Rhode Island mill villages. In Pawtucket, the first major factory town in New England, the growth of many separate, small factories led directly to the haphazard construction of many mills, small and large, along the river adjacent to a series of small dams and weirs. 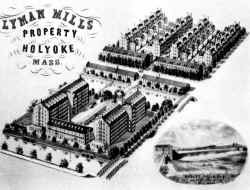 In Lowell, the first mills were arranged in a single', straight row facing the water power canal with their backs to the river, and housing was laid out in regular rows on a rectangular plan. 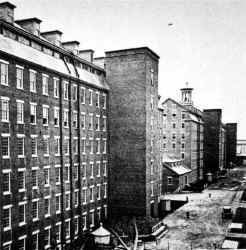 Five mills were constructed in Lowell within the first three years, three with their broad side to the river and one on either end perpendicular to the row. 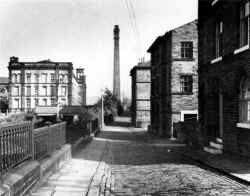 The central mill had a belfry in its ridge. The bell, of course, was more than ornamental, being used to signal the beginning of each part of the workday. The most famous aspect of the plan of Lowell was its social system. Francis Cabot Lowell, followed by Appleton and Jackson, conceived of the plan to attract single, native women from the rural farms to work in the mills, housing them in strictly proper and carefully managed boardinghouses. This was a way of obtaining the necessary labor force to operate such a large-scale industrial establishment in a time of labor shortage. It was these boardinghouses that so impressed such diverse personages as Charles Dickens, Michael Chevalier, Davy Crockett, President Jackson, and many others. They became part of the formula in all of the similarly founded mill cities that followed Lowell, and in some places (such as Manchester, New Hampshire) they continued in use, with many of the same rules and regulations, long after the native girls had left the mills. 6. 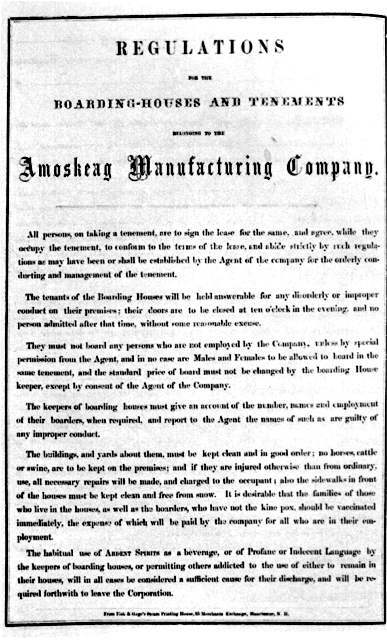 The boardinghouse regulations of the Amoskeag Manufacturing Company; similar regulations existed for the Lowell corporations. This "boardinghouse system," as it became known, along with the other provisions of corporate paternalism both inside and outside the mills, placed Lowell alongside of utopian industrial developments such as Robert Owen's New Lanark in Britain, and Godin's Philanstere in France. However, while some of the procedures were similar to these in practice, the prime purpose of Lowell was not to create a utopian community, but to found one which would work. Physical attractiveness and certain utopian social principles were as much or more a product of sound business judgment as they were a result of idealism on the part of the entrepreneurs. The mill girls and their parents tolerated nothing less than the moral standards imposed, and, in a nation with a shortage of labor, they provided the only available labor supply. 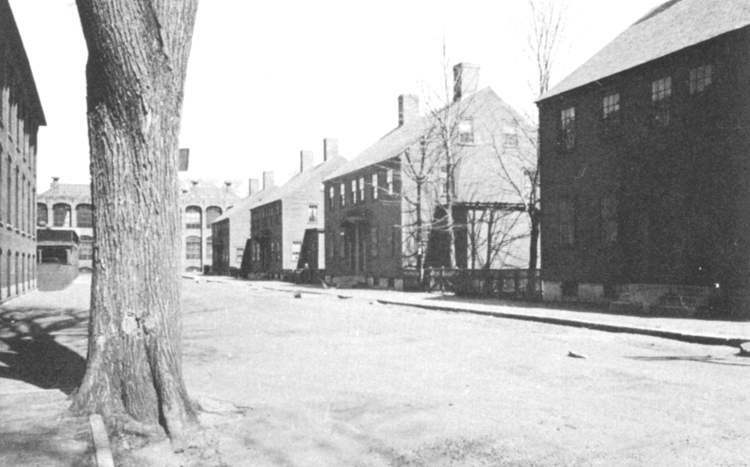 As it turned out, the boardinghouses were a canny business decision; they both attracted the labor and were very favorably received by the press and the public. Lowell's good press continued for its first twenty years, helping to ease the resistance to the introduction of textile factories and industrialization as it spread throughout the United States, and giving the Boston industrialists a remarkable political advantage. The balance of utopian social principles and industrialist pragmatics found expression in the architecture and planning of Lowell.' 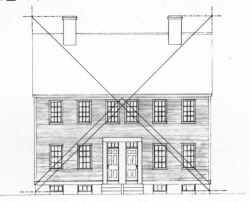 The first boardinghouses constructed for the Merrimack Manufacturing Company were wood clapboard houses resembling the traditional New England farmhouses of the day, and would not have looked out of place in a Shaker village. 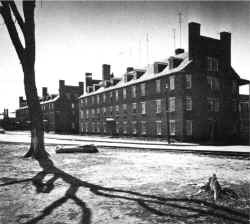 Each building contained two separate boardinghouses. These identical wooden dwellings extended out from the mills in long rows. In the later mill complexes, brick row houses supplanted these wood duplexes. Fire protection was one stated reason for this change, but the architectural expression of durability and permanence was also undoubtedly part of the reason for the decision. 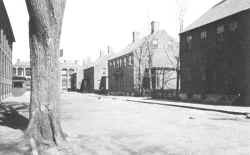 Not surprisingly, the boardinghouses were prominent and substantial buildings, especially after brick supplanted wood for the exterior. Resembling Beacon Hill townhouses, these later brick structures were designed to the same standards of taste, and even on occasion by the same architects. The best surviving examples can be seen in Manchester, New Hampshire. 8. 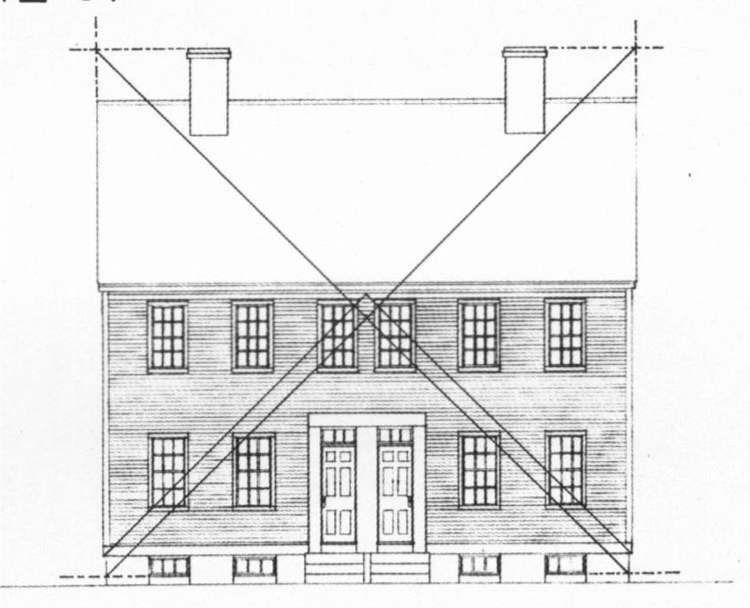 Elevation of the first boardinghouses in Lowell - reconstructed by the author from Figure 5 -showing the formal geometry of the facade. 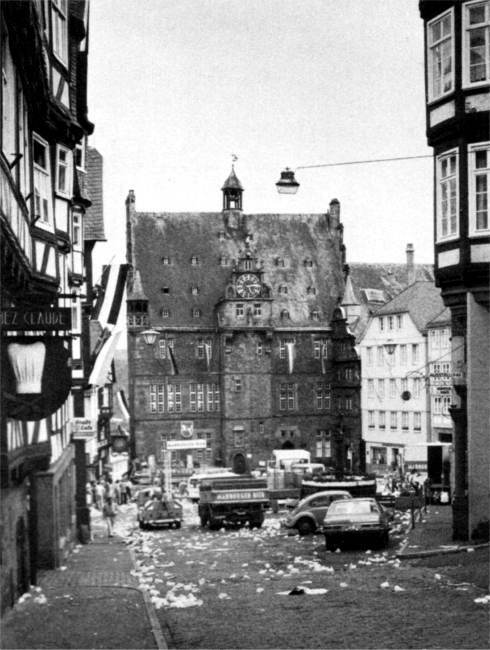 Besides the boardinghouses, the corporations provided a church, a library, a lyceum, and a savings bank. 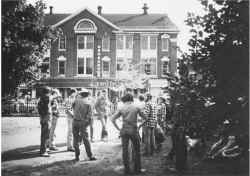 All of these were arranged in the town whose plan was basically very simple: a main street with shops and public buildings on both sides, and a cluster of identical houses for the workers leading off from the main street to the mills. The mills were large structures with the same simple, Federal-style detailing as the boardinghouses and dominated the scene, more because of their size than because of any architectural treatment. A significant design contribution was in the landscaping of the whole area. Lowell's basic plan may have been simple but, with rows of elms, public parks, and deed restrictions controlling the building heights, site coverage, and building use, Lowell and its sister cities achieved a level of refinement and amenity in their environments rarely matched in other speculative new town development. 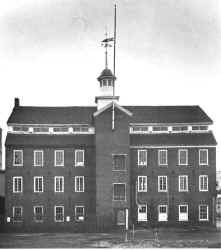 The first mill in Lowell constituted a basic building design that would be employed time and time again as the city expanded, not to mention its imitation throughout the Northeast. 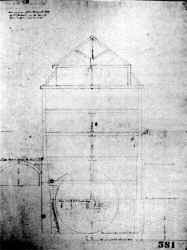 Over the first two decades the basic pattern, established by this 1822 mill, changed only in size, structural strength, and fire resistance, not in architectural form. It was a marriage between the barn and meetinghouse common to New England, and was a vernacular type of building that had parallels throughout Europe and the United States. Even as larger mills were constructed, they retained the simple unadorned appearance of the first Lowell mills. 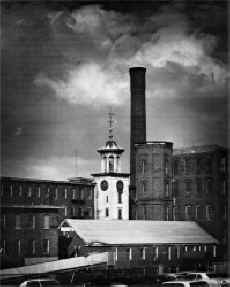 In Manchester, for example, the first mill was referred to as having been built according to "the Lowell Plan." 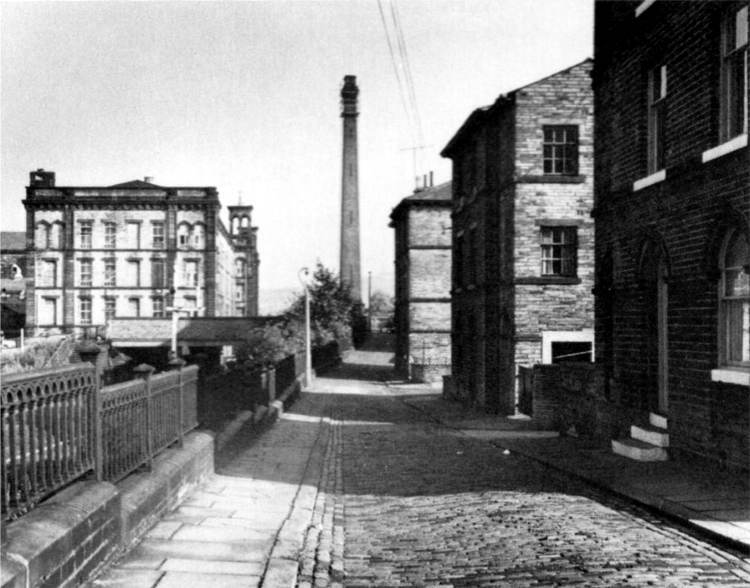 2 By 1845, when Lawrence was founded, the size of each mill had been greatly expanded in length and in height. The first mills constructed in that city, the Bay State Mills, were remarkably oversized versions of the original Lowell mill type, rising nine stories, at that time a remarkable height for a wood and masonry structure less than sixty feet wide and full of machinery. As late as 1850, the type appeared again in the Lyman Mills of Holyoke with just a slight vestige of Greek Revival trim. In the case of every city modeled upon Lowell, the pattern was the same, with the first mills designed according to this original formula, and only later phases of mill construction showing more expressive and fashionable examples of architectural taste. In other words, the entrepreneurs chose to begin in each city with functional buildings devoid of any contemporary architectural statement, except for an occasional cupola containing a bell. The matter of style was considered insignificant compared to the need for utility. The plan for the first mills and housing in Lowell can easily be seen to be at the root of each succeeding millyard development, not only in Lowell, but also in each of the cities which followed it. 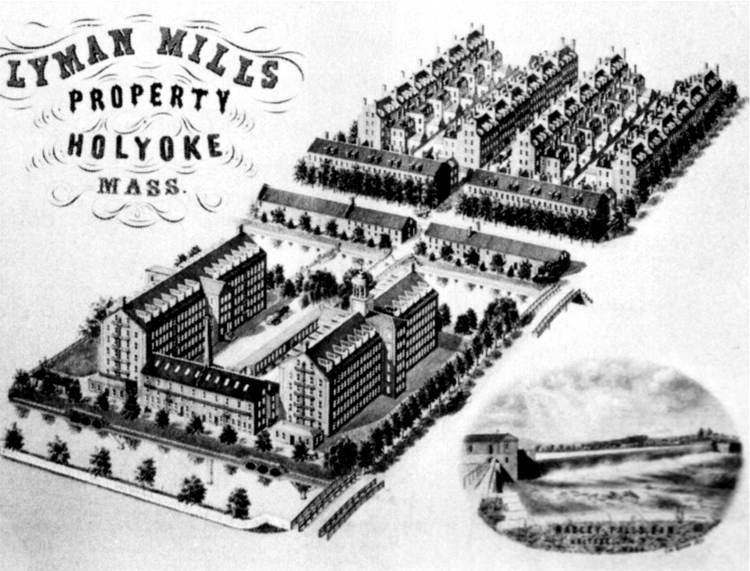 However, after twenty years of growth and development had taken place, the simplicity of Lowell's original plan became lost in a tangle of diagonally intersecting streets, with mills and housing located on both sides of the main street in a pattern that left clusters of housing isolated by double ranks of mill buildings and mill canals. 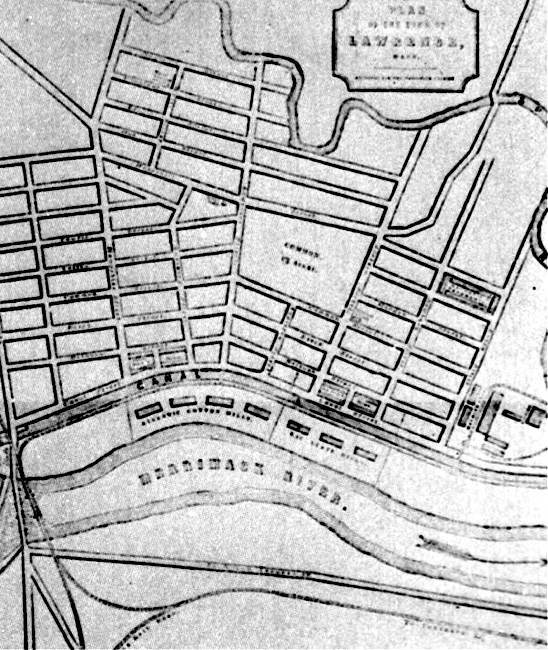 The Lowell plan of 1835 does not resemble a classical layout of a pre-planned city. 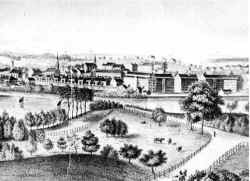 Lowell was not planned for grand visual effect despite the influence of the late-Baroque planning in Washington and in the original plans for Paterson, New Jersey. The canals provided some remarkable opportunities for visual design, but, at least initially, they were almost entirely unexploited. Despite their grand intentions the entrepreneurs founded, during the first phase of Lowell's growth, a 22 series of separate and distinct companies and built individual millyards with separate canals, sometimes without any relationship to each other. Later a wider canal had to be constructed at great expense to increase the water supply to the older canals. 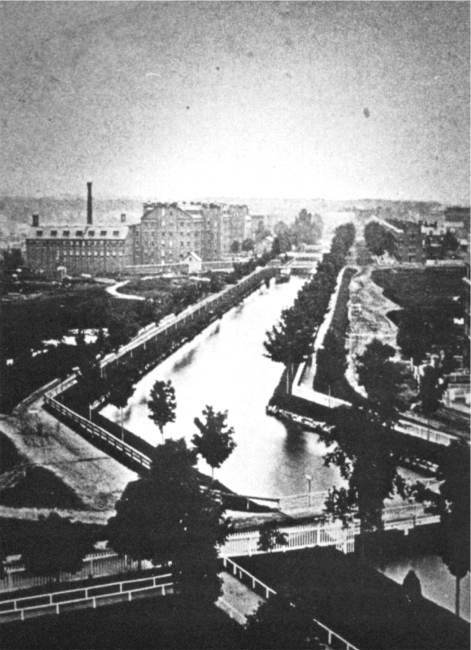 Only in the later cities did a single plan encompass the entire city, and only in the case of Lewiston, Maine, one of the last cities to follow Lowell's model, does the original city plan show an overall, urban design unity,' although the failure to develop one of the key, main-canal mill sites prevented the completion of this impressive scheme. 19. Plan of Lowell, 1841. 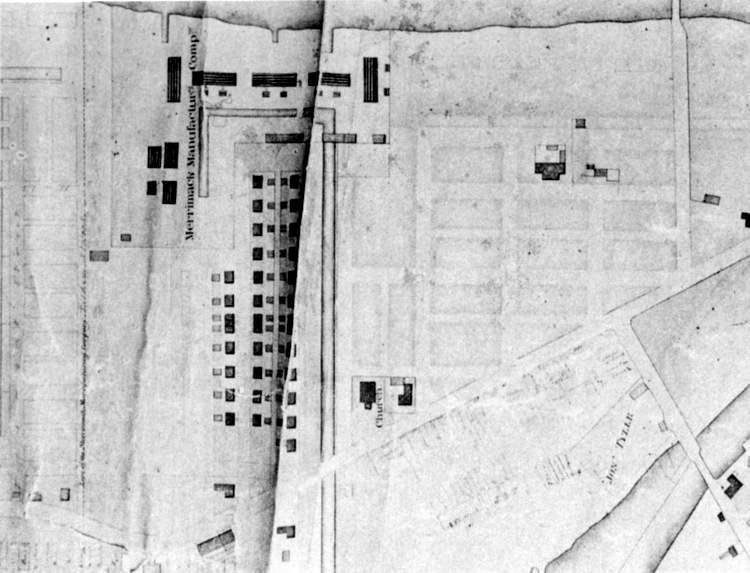 This plan shows how the orthogonal layout of each mill cluster did not extend across the entire city, and how the downtown area (center) was squeezed between the two areas of mills. 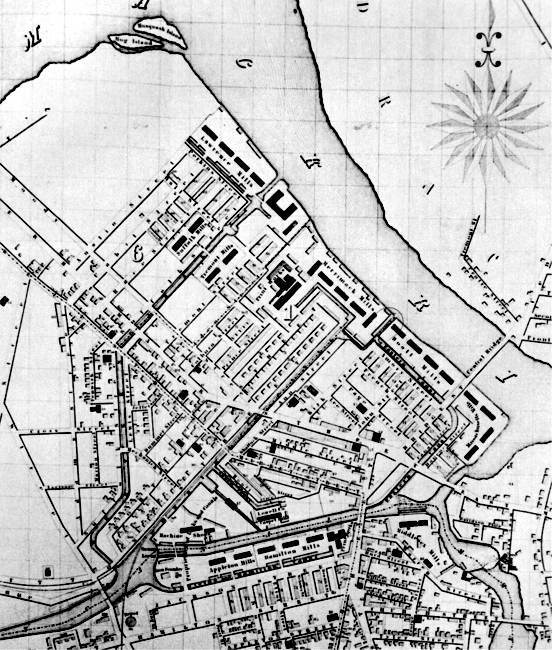 The lack of visual expression notwithstanding, the plans of the cities which followed Lowell were more orderly, with the canal or canals parallel to the river, the mills in an orderly row between, the rows of boardinghouses opposite, and the main commercial street and the grid of private residential streets running adjacent to the whole group. 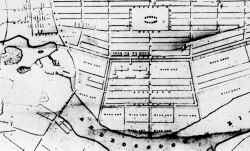 It was, in fact, the plan of Lowell's individual millyards, rather than its city plan, which became the formula for the layouts of the later mill towns. 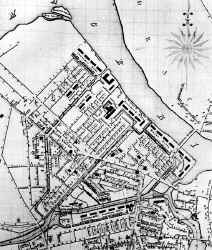 The plans of Manchester, begun in 1837, and Lawrence, begun in 1845, show a clear linear pattern defined by the rows of mills on one side and the workers housing, the main street and private residential area on the other. 23. Plan of Lowell. ca. 1830 This plan provides a remarkable view of the grand scale of a part of Lowell which was never completed. Only nine of the twenty-two mills shown were ever built, and even those exceeded the capacity of the available waterpower until a new canal was constructed in 1845. The massive area of company housing needed for such a development is shown as many parallel brick blocks, with a unique touch of Baroque in the tiny circles to relieve the monotony. 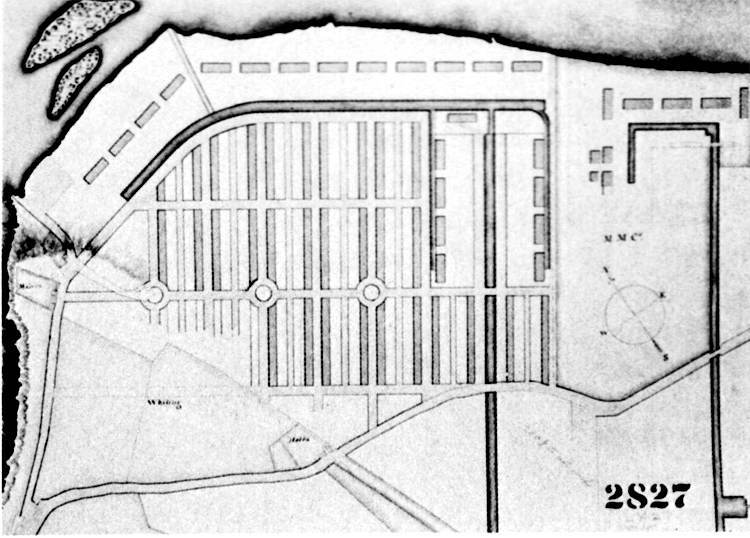 Except for the circles, this plan resembles the layout of early Manchester, New Hampshire, most closely, but as a vision of an unrealized development of massive scale, it is a precursor of Holyoke. 24. Plan of Lawrence, 1845. 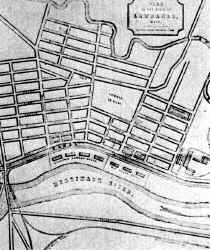 Lawrence exhibits the simplified layout of the later cities with mills and canals parallel and adjacent to the river, followed by the boardinghouses, the commercial center, the town common, and the private residential areas. 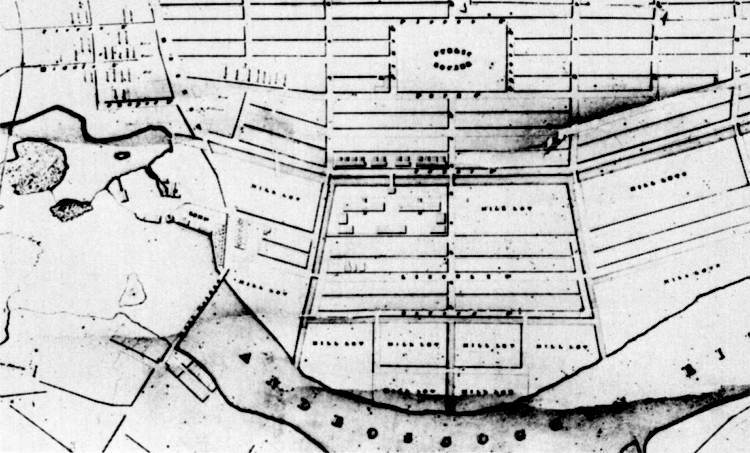 The plan of the millyard clusters in Lowell, in which each cluster represented an individual company, was the basic building block for the total plan of these later cities, but it was not until these later developments that there emerged a layout that was of city scale. When Michael Chevalier visited Lowell in 1939, he wrote, "Lowell is not amusing, it is decent, peaceable and sage." This perfectly characterized both the virtues and the limits of early Lowell. Particularly revealing is the lack of any singular architectural symbol that could have given early Lowell a central focus or identity. 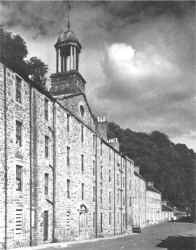 The symbols were the boardinghouses and the mills as building types, to be repeated in rows as far as practicable. Lowell sharply contrasts with those utopian communities which used sophisticated architectural expression in their plans, such as Robert Owens's proposed project for New Harmony, and the more business-oriented Saltaire by Sir Titus Salt, outside of Bradford, England. 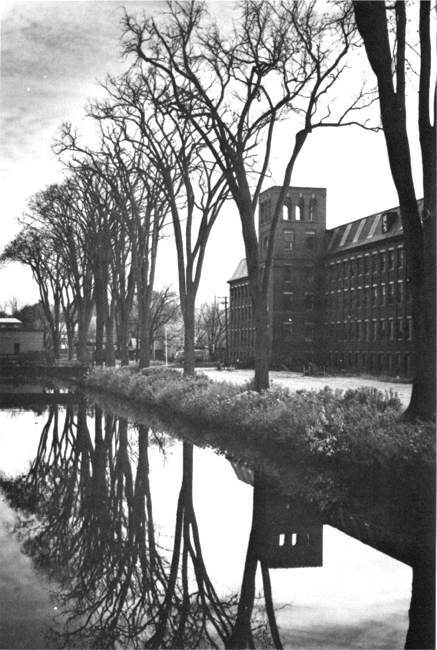 1 For a thorough and creative study of the architecture of early Lowell, see John Coolidge, Mill and Mansion, 1931. 3 This should not be confused with the results in Manchester and other cities where urban design of a high quality resulted from the subsequent extension and rebuilding of the mills, etc.